wait.. what did I say about the leather? Hey, will one of those FM transceivers work with these old dial type radios? Or do they require digital tuners? Damn I love the dash in that thing. So cool. 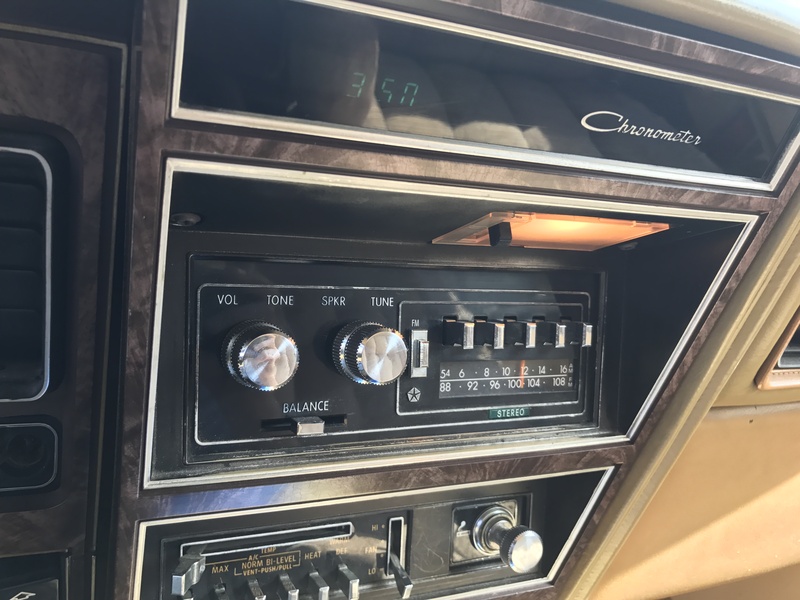 Not sure if one of these will fit, but this company has original style radios with modern guts; they are a bit pricey, but you can also get hidden units that allow you to keep the old radio and dash in tact; that are a bit cheaper; and still give you all the modern amenities. Hell yeah! That's exactly what I was looking for.. though you're right about the pricey part! Damn! So Charlene was giving me some fuel issues yesterday. She decided to cut off on me, like she ran out of gas... took a few minutes of playing with her to get her started up again. I guess I still need to replace that fuel filter, and probably the pump. For the time being, I threw a can of Seafoam in the tank to eliminate any moisture.. and wow! What a difference! This stuff is amazing. Still having fuel delivery issues. One of my buddies on the FMJ body forums thinks it might be the 4" long jumper line at the rear (from the tank to the main line) may be rotted and sucking air. There's air getting in somewhere... either that or it's trash in the tank? Idk, I replaced the filter, but that didn't change anything. She'll run fine for a while, then just die. Then won't start for a while until she cools off. I guess I'll have to pull the tank to get to these "jumper lines". Too bad they didn't make an access panel in the trunk! Maybe looking at having to replace all the fuel lines. Sending unit? I wonder if that's part of the problem. When I remove the gas cap, it releases a bunch of pressure as well, so I wonder if I just need a new vented gas cap. Fuel system not venting properly... vaporlocked? Do these cars have a Fuel Vapor Recovery System? I'm assuming they do as starting in the early 70s all the emissions sheet starting going in and killed horsepower, etc. I wouldn't think you actually have a gas cap that vents to atmosphere unless it's a safety thing. Must be a path for the pressure in the fuel system to vent pressure to a charcoal canister or similar. Check your FSM for the Emissions system. Also with that carb conversion maybe the PO altered something related to the Emissions/Fuel system that's related to your problem. Yeah, it has the canister. I pulled the "vent line" going to it to see if it'd make any difference but it didn't. I have an FSM that I bought from an Ebay seller on it's way... should be here this week sometime. Definitely a must have for this car. Maybe I should try bypassing that charcoal canister altogether... It's not like FL has any emission checks any more. Sounds like you've got an issue related to the fuel tank venting to the emissions system. Without knowing what plumbing/components there are who knows? Guess you'll have to wait for the FSM? Again...the PO might have removed/plugged/disconnected some Emissions lines that are affecting this. Is there an Emissions sticker in the engine compartment that shows the basic diagram of the Emissions system? That will tell you how all the lines were hooked up originally and you might be able to do some checks with that. Nah, there's no sticker. The FSM will definitely help. Still, I'm not sure what was supposed to be changed with the lean burn to ECU conversion. So things that aren't connected, but are still there might be that way intentionally. I've also read about the carb getting too hot and "percolating" the fuel, causing a vapor lock like condition. Idk.. I'm just going to have to tinker with it. Another thought, and tip that I've read about, is replacing the charcoal canister with one out of a newer vehicle if I suspect that the vapor/venting is the problem. It's weird, cuz right now I can go out there and she'll start right up. Now that she's cool and been sitting for a few hours. And she'll run perfect, like nothing ever happened lol.. I might try to siphon some gas out of the tank. It sure seems like this level in the tank (about 7/8ths full) is where it starts having issues. Of course this could all be just my imagination. Sure sounds like Vapor Lock symptoms.